T3559LF-WL is rated 4.8 out of 5 by 16. Rated 5 out of 5 by alicia g from Well-priced for a great design element!! I am an interior designer & recently spec-ed these for a client's remodel. They are well-made, beautiful, & a great price-point for the look! Rated 5 out of 5 by Westhot from Delta faucet Arrived very quickly. Faucet is heavy in your hand, feels good quality. Looks beautiful installed. 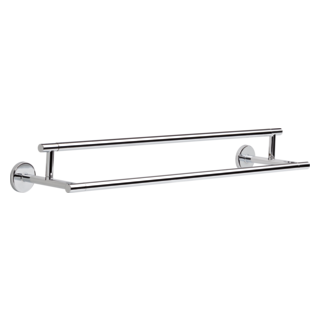 Easy to use, a beautiful addition to our remodeled bathroom. Rated 4 out of 5 by Rjahm from Good clean look Used with vessel sink and natural wood in pool bath. A bit of extra work to order the matching everything that goes with it for install. 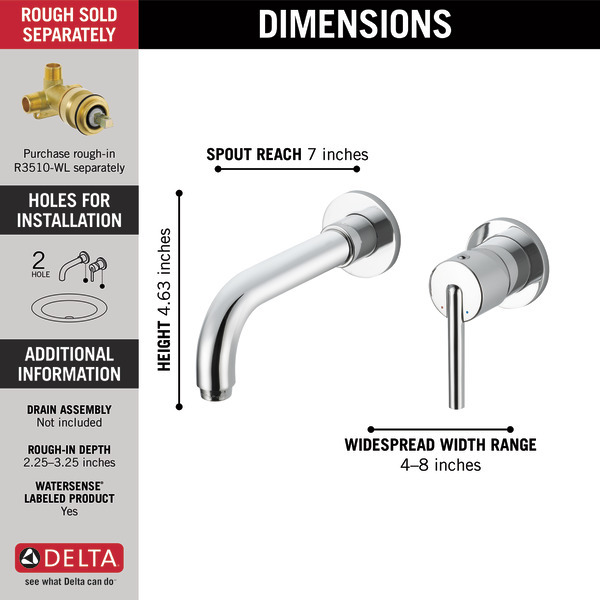 Rated 5 out of 5 by JanM from Wall mounted faucet I love Delta products. Had a need for a wall mount faucet and there it was. Perfect for our situation and you can’t beat Deltas quality or design. 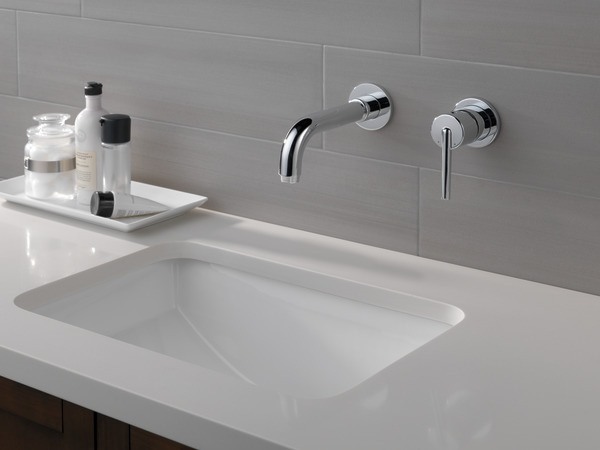 I try to use Delta for all my plumbing fixtures as we have experienced their trusted permanent in the long run and their classic styling for years. Rated 5 out of 5 by KatieV from Beautiful - just what we wanted We installed two of these faucets in our new bathroom and love the way they look and function. Our contractor installed them, so I cannot tell you how difficult it is to do yourself. I know they did have some issues with the separately purchased valves and those had to be replaced. Rated 5 out of 5 by Mangoes and Mud Design from Affordable Wall Mount Faucet I love everything about this wall mount faucet. This is my second purchase for our vacation home. We had one installed over a year ago for our master bath. I had to use it again. It is a simple design that can go with any decor. It works great and the price is perfect compared to many other brands. 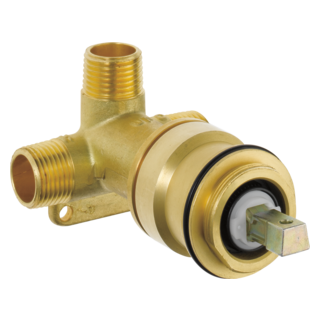 Don't forget to purchase the rough in valve and have a plan for your contractor on where you want it. 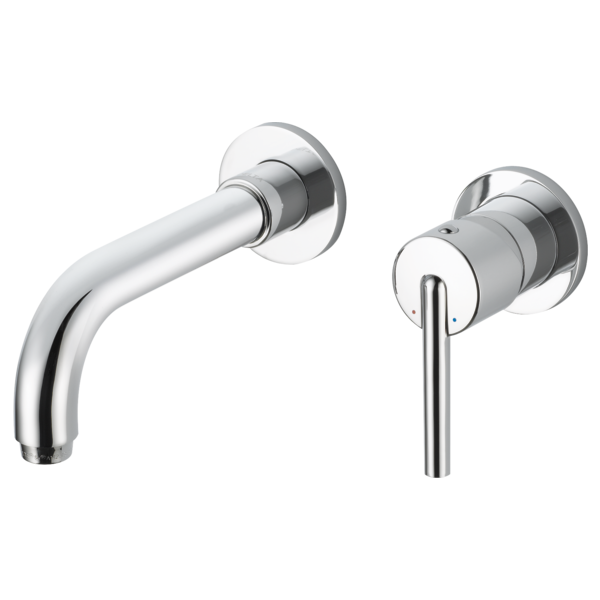 Rated 5 out of 5 by Flatbrook from Powder Room faucet It looks great, easy handle and good length of water spout. Rated 5 out of 5 by Case from Love the Look! Love the function! 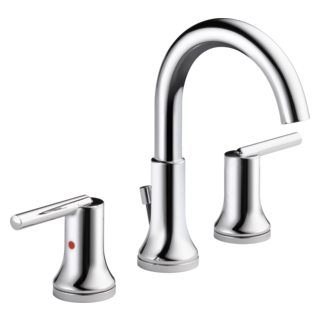 This faucet is great - can't go wrong with Delta! We have this in our guest bath with a vessel sink and it looks great! very easy to use as well, I was worried about the function of the handle but it was very intuitive. Thanks BUILD! Is this faucet available in a 1.0 GPM aerator? what is the model number for the corresponding drain assembly in matte black? Do you have a shorter (~4in) wall mount bathroom sink faucet, similar to the 7.5 in T3559LF-WL ? 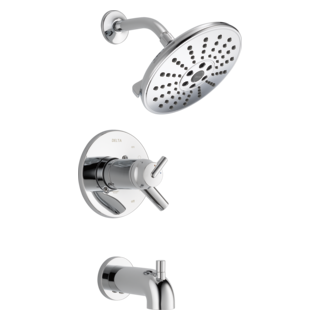 I am interested in wall mount faucets and have had good luck with Delta in the past and wanted to see what you have. It is confusing though: Model # T3559LF-WL is $200 and Model # 3559LF-WL is $315.45 but they look nearly identical and I haven't figured out what advantages the more expensive one has - can you tell me? What does the T in the model name represent? Also, am I right in assuming that the turning the lever from side to side adjusts temperature and pulling it out increases the flow and pushing it in shuts it off? (Is this true in both models above?). Thanks, and please keep trying to keep the costs down on wall mounts. It is annoying that they are so much more expensive than sink mounts and you have one of the more reasonably priced wall mount faucets on the market (even more so with the $200 MSRP one).